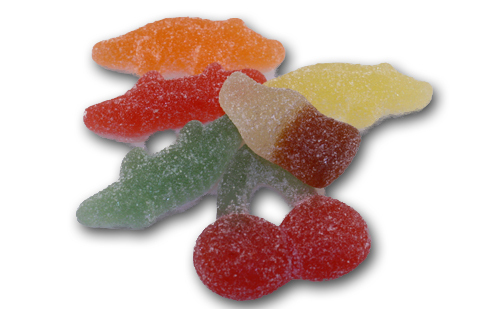 If you had to guess what Haribo’s 3 best sellers in the UK were, what would you say? Wrong! They’re Starmix, Supermix, and this one. Tangfastics. 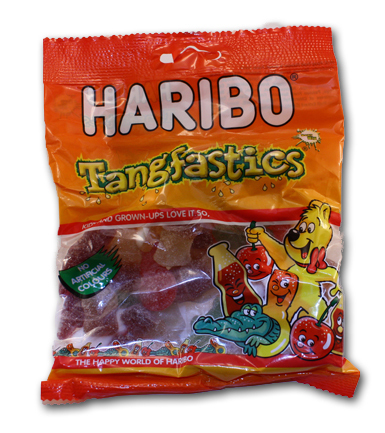 Tangfastics are basically a collection of Haribo’s best selling sour gummies. Nothing earth-shattering, but also nothing to turn your nose up at. It’s a good sour mix. You get sour cherries, sour cola bottles, sour crocs, and…..nothing, You’re supposed to get sour pacifiers, which for some reason I love above all these other things, but I didn’t get any in my bag. Not happy! These aren’t horribly hard to find on the web, so click the link below if you want to check them out. Sour Haribo? Kinda bulletproof. It might not be th best ever, but it’s likely better than most sour gummies we get over here.